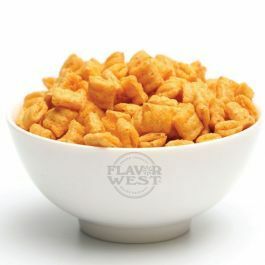 From Sweet and Crunch flavoring comes crunch cereal flavor that keeps you talking about it's amazing sweet taste all day. A drop enhances the flavoring in your desserts, pastries or cookies. Type: crunch fruit cereal water soluble flavoring. Ingredients: Natural and artificial flavoring, propylene glycol and alcohol. USP Kosher Grade Flavoring Usage Rate:15-20% for E-use. Flavor Suitability: Drinks and beverages, smoothie, desserts, pastries, baked treats and more. Specific Gravity: 1.05 No Refunds on Flavoring.